Since I approached Erin regarding this writing opportunity on her site, I’ve been trying to come up with what I wanted to cover in my first review. 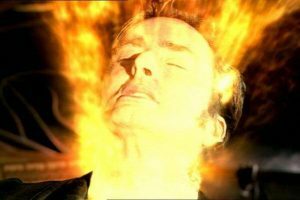 I finally decided on “The Christmas Invasion,” which is the first Doctor Who episode of the current run where we get to watch as the Doctor’s companions have to handle the transition from one Doctor (#9, played by Christopher Eccleston) to the next (#10, played by David Tennant). This was a decision I came to about a week ago, and even then I struggled on what angle I wanted to approach the topic. The episode is filled with quotes from Rose, Jackie and Harriet Jones that can very easily be connected with “the Trans experience” (spoilers, there is no specific “Trans experience”, it’s different for all of us). However, something happened to me after I tried to write this article the first time, that I feel this episode speaks to as well. The same day I watched the episode (one week ago as of my writing), I came out to one of my closest friends. I’ve known him for 20 years. We met on the school bus and hit it off quickly discussing how to finish Monkey Island (an amazing video game by Lucas Arts if you are not familiar). Last week I sat him down and told him the truth about myself. Up to this point, I had come out to a little over 30 people (current count is 33) and I had only had positive reactions. Almost everyone was surprised as I’ve hidden it well, but then about ten seconds later I’d get a shrug and an, “Okay, what do you need from me?” (The answer to that question, by the way, is always “your support.”) This friend, however, didn’t seem to understand what “I’m transgender” actually meant. After taking a moment to realize I wasn’t joking — and this is not the first time I’d had this reaction, but it was the most vocal version of it– we talked about it for a bit. The conversation seemed rather awkward. He asked me a few questions that left me wondering if he actually understood what it means to be Trans, which in all honesty I’m not even sure I fully understand. At one point he said, “I guess I’ve never really contemplated what it means to be male.” I replied with, “That’s a pretty philosophical question that I can’t answer for you.” A lot of his questions were this tough, the “whys” of it. I can’t explain why I’m Trans, I can’t even explain why I know I’m Trans, I just am and do. I was left feeling a little down on the interaction, and I’m sure he was too. Here’s someone who he probably felt he has always understood, and suddenly he doesn’t understand what is (and by what I’ve told him, always has been) deep inside. I think Rose goes through something similar in this episode. The Doctor has just transformed into someone who looks and acts completely different. He passes out, and she listens to his heart. But then she realizes he has two. 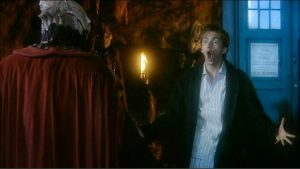 However, slowly, throughout the episode Jackie and Rose begin to realize that the Doctor hasn’t changed as much as they thought. At one point Jackie asks the Doctor what it is that he needs. He has a hard time getting a word in as she keeps asking. Finally, he says “I need you to shut up” and Jackie retorts with “Oh, he hasn’t changed that much”. She begins to realize that maybe it is the same person she knew before. Harriet Jones also has some difficulty accepting this new Doctor. She asks “What happened to my Doctor?” His response is priceless, and rings dearly in my own heart, “I’m him. I’m literally him. Same man, new face. Well, new everything.” Granted those pronouns need to be changed up a bit, but it is pretty much how I feel on the whole issue. I’ve realized in the days since, that this friend is just a curious mind, he always has been, he wants to understand “What Makes You Tick”. This is why he has asked me so many questions. He’s trying to understand this new topic from all angles he can see it from. I realized I had a good way of wording it, that I hope he understood: “When I have painted nails or am wearing a dress, I feel happy. It’s a very deep happy. However it’s not a happy I can really explain to other people”. In the end, I have no doubt that he will still be one of my closest friends. Like Rose, he’ll start to realize that I am still the same person. I’ll still make Hitchhiker’s Guide references. While I’ve changed, I still would love him to come with me on my journey of life. Update: Apparently it has been 2 months to the day that I originally wrote this post. I feel it is important to note that I feel this friend has come a long way since I wrote the article. I know he plans on reading it, and I hope he doesn’t take any offense to it (and if so, I know we’ll discuss it privately in text messages, as we did earlier today). Oh and the count of people who know has almost doubled…. 64 (give or take a few outliers)!